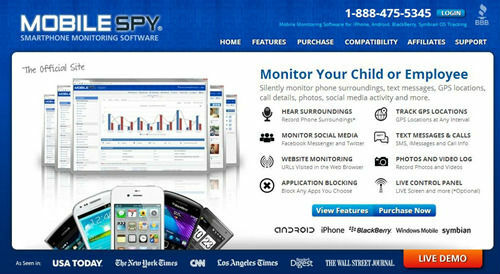 Use Mobile Spy Software to monitor your children or employee's online activity. The following article provides an overview of a product called Mobile Spy, another cell phone monitoring software solution that gives you the ability to monitor phone activities. Learn the TRUTH about what happens on smartphones that you own. Using this mobile spy program, your activity logs are safely stored in your private account which is accessible from any web browser using a username and password you create. The cell phone monitoring activities recorded are described below. All activities include a date/time stamp and are searchable by phone number. All logs can be easily exported to CSV for importing to a database. Login any time from any location to view results without needing access to the phone. Logs Calls – Each incoming and outgoing cell phone call number is logged along with duration of the call and time stamp. Logs SMS (Text Messages) – Every text message is logged, even if the cellular phone’s logs are deleted. Includes full text of text messages. Web Site URLs Log – Each address entered into Internet Explorer Mobile is logged, so you can track web browsing activity. This is a Windows Mobile feature only. Log Summary – A summary of all cell phone activities can be shown along with separate viewers for each type. Record Surroundings: Get instant audio clips of the phone’s surroundings on-demand. Stealth Camera: An industry first. Instantly snap a photo with the phone’s camera. Alerts – Get alerts for a variety of reasons. Get an alert if the device travels outside a specified area. Also, get an alert if profanity is encountered within a message or email, if any keyword you choose is encountered in activities, if any specified contact communicates with the device. Or, if the wrong password is entered on device lock screen. Download instantly after ordering. Request new software downloads anytime. Child: You can only monitor your own legal child that is under the legal age of 18. Also, you must use a compatible phone that you own. Unless you are the legal guardian thereof, you cannot monitor a child if you hold one of the following relationships: Brother / Sister, Step-Brother / Step-Sister, Aunt / Uncle, Nephew / Niece, Cousin, Grandfather / Grandmother, Great-Grandfather / Great-Grandmother. Employee: Your employee at a company you own OR an employee at the same company as you and you have supervisory responsibilities over. Only monitor employees using a compatible phone that your company owns and issues to the employee under your company’s policies regarding company phones. Notify the employee before monitoring begins. Do not use Mobile Spy to monitor any other individuals (such as a spouse, friend, significant other, etc.) without that party’s expressed written notarized consent. Without this consent, it would violate the terms agreed to at the point of purchase and be subject to immediate termination without reimbursement. Be aware that, as the owner of the phone to be monitored, unrestricted physical access to the phone is required. Unrestricted physical access is defined as: Customer has access to the device while the device is in their hands. Customer has all passwords, pass codes, lock screen codes, etc. to unlock the device to gain access. Visit the Mobile Spy website to learn more. If you have any questions, comments or feedback on Mobile Spy, please post a message below. Also, see our reviews of other cell phone tracking software apps, including the mSpy mobile phone tracker.